GO-Global is the easy application access and Web-enabling solution that provides instant access to Windows, UNIX, and Linux applications. It eliminates the need for complex infrastructure such as Citrix XenApp or limited Windows-only solutions such as Microsoft Remote Desktop Services (formerly Terminal Services). Download competitive product analysis. *Enabled with GO-Global for UNIX. **Enabled with GO-Global Gateway. ***Enabled through third parties. Now you can view and interact with your favorite Windows applications right from your iPad, iPhone, or iPod Touch using just your fingers. Our GO-Global iOS Client app uses intuitive multi-touch gestures to achieve popular mouse and keyboard operations. Features include auto-zoom, auto-resize on device rotation, voice-to-text input, plus iPhone and iPad 3 screen display optimization. NEW: GO-Global iOS Client is now supported through GraphOn's GO-Global Gateway. To access Windows programs on your iOS device, first purchase or download a free trial of our GO-Global for Windows software. Then download the free GO-Global iOS Client app from the Apple App Store. To evaluate the iOS Client without installing GO-Global for WIndows, simply download the iOS Client and then connect to our online demonstration server to interact with popular Windows programs. Read about our private label iOS Client option. Our free GO-Global Android Client lets you interact with Windows programs right from your Android-powered tablet. It provides excellent performance and an increased level of usability on Android's touch-screen. 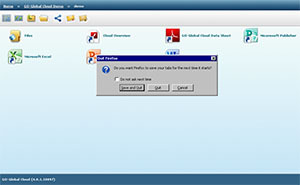 To access Windows programs on your Android, firstpurchase or download a free trial of our GO-Global for Windows software. Then download the free GO-Global Android app from "Google Play". To evaluate the Android Client without installing GO-Global for WIndows, simply download the Android Client and then connect to our online demonstration server to interact with popular Windows programs. Read about our private label Android Client option. GO-Global iOS and Android Clients make use of intuitive multi-touch gestures to achieve popular mouse and keyboard operations. Both clients incorporate Auto-Zoom, a valuable feature for different screen sizes and touch screens. When accessing Windows applications, Auto-Zoom detects the section of the screen currently active in the application and automatically zooms in on that area. Solusi untuk Pembuat Software agar software nya bisa diakses multiplatform. GO-Global is the fast, simple and affordable way for independent software vendors (ISVs) and application service providers (ASPs) to instantly extend the reach of existing Windows, UNIX and Linux applications to the Web or to different platforms. It's the ideal way to reduce your time to market and quickly reach new audiences, increase revenues, and strengthen your brand. You’ll eliminate the time, money and effort normally required to rewrite applications for the Web or port them to new platforms. And you’ll retain 100% of your application’s features, functions and branding. GO-Global Is Easy. Your application runs unchanged on a central host along with the GO-Global software. It’s then instantly published or “served up” to local and remote client devices. With GO-Global, there's no need for complex infrastructure such as Citrix XenApp or limited Windows-only solutions such as Microsoft Remote Desktop Services (formerly WTS). Check out our GraphOn vs. Microsoft and Citrix product analysis. GO-Global Is Transparent. On the client side, users simply run one of our clients or browser plug-ins. From the user’s perspective, your application looks, feels and performs exactly as if installed locally on the client device. GO-Global Is Fast. Our advanced technology includes the patented RXP protocol for fast, LAN-like performance over all network connections, including low-bandwidth lines, modem connections, and latency-intensive Internet links. GO-Global Client Branding. This client-side solution, ideal for ASPs or hosted-service providers, re-brands all GO-Global Clients except the iOS and Android Clients. GO-Global Host and Client Branding. This solution re-brands all GO-Global Host modules as well as all GO-Global Clients except the iOS and Android Clients. GO-Global iOS Client Branding. This solution re-brands the iOS Client. It can be selected by itself, or in addition to one of the first two alternatives above. GO-Global Android Client Branding. This solution re-brands the Android Client. It can be selected by itself, or in addition to one of the first two alternatives above. Download our ISV solution sheet. Download our ISV private-label solution sheet. GO-Global Gateway is the easy and cost-effective way to create a secure, private cloud environment. As a standard GO-Global for Windowsfeature provided at no additional cost, GO-Global Gateway gives administrators extensive control over user rights and privileges, allowing them to monitor and manage clusters of GO-Global for Windows Hosts. Users can access and share applications, files, and documents via simple hyperlinks. And developers can integrate Windows applications into Web-based enterprise and workflow applications using the GO-Global Web API. GO-Global Gateway runs under Windows Server 2012 R2, Windows Server 2012, Windows Server 2008 R2, Windows Server 2003 R2 or Windows Server 2003. It can be installed on a standalone Windows Server, or together with GO-Global for Windows Host on a Windows Server. Anywhere Access. GO-Global Gateway requires only a Flash-enabled browser to run applications and open documents, using standard ports (such as 80) and standard protocols (such as HTTP) to communicate. Centralized Administration. Administrators can easily manage GO-Global Hosts from virtually any computer that has a Flash-enabled browser or a GO-Global Client. High-Availability, Load-Balancing Clusters. Administrators can create high-availability, load-balancing clusters of GO-Global Hosts with no single point of failure. The load is balanced among Hosts taking into account factors such as CPU usage, memory usage, and the number of running sessions. Application-based Load Balancing. If an application exists on multiple Hosts, GO-Global Gateway automatically starts the application on the Host with the lightest load. Windows applications no longer need to be installed on every GO-Global Host in a cluster. Enterprise-class Security. Ensures that only authorized users are allowed to connect to Hosts and access applications and documents. When installed on a Windows Server, it supports name/password, client certificates, Integrated Windows Authentication, and Active Directory. Secure Document Sharing. 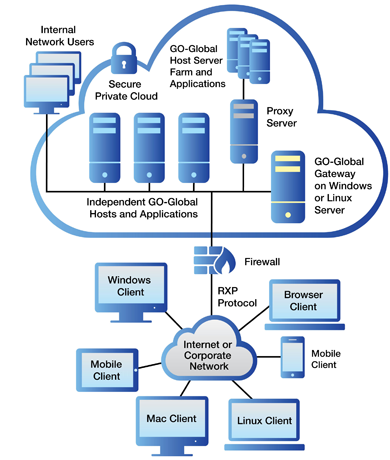 Users can securely access and share documents and files from GO-Global for Windows Hosts. Depending upon access rights, users can view and edit documents even if they do not have the corresponding Windows application installed. The documents never have to leave the secure GO-Global Host. User Workspace. Lets users access their applications and files from a their virtual Workspace, incorporating an intuitive, redesigned user interface. User Sandbox. Allows administrators to isolate a user’s Workspace, limiting access to specific applications and files. This protects the Host from intentional or unintentional damage. And it ensures privacy, giving each user a protected place on the Host, so other users cannot accidentally view or delete sensitive information. Hyperlink Access. Every resource on a Host can be accessed via a hyperlink. Users and administrators can share applications, documents, folders, files, and sessions by simply sending a hyperlink in an e-mail or instant message. Active Directory Integration. Integrates seamlessly with Microsoft Active Directory. Administrators can manage user access according to the user accounts, passwords, and security settings stored in the Active Directory. 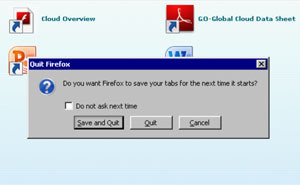 Single Sign-on Support. Improves user productivity by reducing the time required to log into multiple applications, as well as administrators’ ability to enforce uniform enterprise authentication and authorization policies across the enterprise. Automatic Client Updates. Administrators can configure GO-Global Gateway to automatically update clients when users connect to a Host running a newer version. HTTP Tunneling. GO-Global tunnels GraphOn’s RXP protocol over HTTP, enabling users who connect via Web proxy servers to run applications on GO-Global Hosts. GO-Global Web API. Windows applications can be integrated with existing Web applications. Most GO-Global features can be controlled programmatically from Web-based applications using the Web API. Developers can start and monitor sessions, authenticate users, create workspaces, move files to and from a Workspace, start and stop applications, monitor server usage, and more. NEW: Mobile Client Support. iOS and Android mobile client access to GO-Global Gateway. There is an ongoing debate surrounding automation and the impact that it has on people’s jobs. It may seem that after waves of blue-collar jobs were supplanted by technologies since the dawn of the machine, that white-collar jobs are now under threat. While some technologies threaten to encroach on traditional office tasks through their ability to complete administrative, service-focused, and even writing-based tasks, these concerns are often misjudged. Technology has transformed the office over the past thirty years but people have not become unemployed. They have just changed what they do and how they do it. > See also: Busting the enterprise automation myth: are businesses right to still be wary of SaaS? Take software automation as an example. Many organisations employ large numbers of IT administrators and support staff to manage the deployment and use of software. Updates and new versions of software are produced at regular intervals and typically need to be tested by an organisation before being deployed to make sure that it is compatible and does not create bugs in the wider IT estate. In the past, this activity needed to be completed manually, taking long periods of time and resource. With automation, new software updates can be automatically tested in a secure way and then deployed without manual involvement. An evergreen approach such as this has not led to IT teams being made redundant but has led to their skills being used in different ways. Rather than replacing existing skill-sets and claiming jobs, technology augments workers’ talents enabling their job to be completed more effectively. It is important to remember that most automations are used to enhance users’ interaction with an interface rather than to reduce the users to being obsolete. At the same time, it’s not cynical to point out that automation is usually deployed to cut costs and drive profit. But this doesn’t necessarily equate to workers losing their jobs. The use of technology is now becoming the key differentiator between competing companies and their profitability. Constantly innovating better ways of working to meet customer need while increasing profits has always been the focus of successful businesses and today that focus sits almost completely within how technology is used and deployed. Automation has therefore freed up resource for people to think about what they do and to find better ways of doing it. Far from removing jobs, automation has led to the creation of more interesting work. So we have seen first hand how automation can transform the role of the IT department in companies from one of keeping the lights on to being at the centre of company-wide innovation and process improvement. Improved business processes that allow employees to deal with the more challenging aspects of their job drives profitability, and keeps the whole business on its toes. By throwing the importance of productivity into sharp relief, workers will worker harder in their own jobs, and will be more able to recognise their worth in the business. This will drive profitability and should create jobs in more business-critical areas, rather than reduce workplace moral with redundancies. The past need not always inform the future. How can data center managers get more from their data center model? Bill Kleyman looks at five areas where you can optimize. It’s a new year and once again data center professionals are looking at new ways to make their infrastructure even more efficient. At this point, the modern data center has become the central hub for almost all technologies. Whether it’s content delivery, data distribution, or just overall business support, the data center is absolutely critical for today’s business to thrive. The proliferation of cloud computing and IT consumerization has all driven a pretty big boom in data center demand. Because of this, data center administrators are constantly trying to find ways to improve performance, enhance infrastructure density, and increase multi-tenancy capabilities. As more converged systems make their way into the data center, infrastructure optimization will be critical to maintain a high level of service. So what are some great ways that you can optimize your data center? How can data center managers get more from their data center model? Let’s look at a few ways. Software-defined technologies (SDx) and virtualization. The capabilities of the modern hypervisor are light-years ahead of what was possible just a few years ago. We are now able to directly integrate with key APIs to reduce resource hops and drastically improve workload performance. Even more so are the new technologies around software-defined networking, storage, security – and the data center! Our ability to abstract so many critical layers is a huge reason why we can build in many more data center efficiencies. New levels of network virtualization allow administrators to create vast network environments capable of spanning numerous data center across many countries. We are no longer bound by hardware requirements. Software-defined technologies are capable of delivering many kinds of data center efficiencies at numerous different levels. Utilize cloud computing. There is a very real reason that hybrid cloud platforms are gaining so much popularity. One great way to increase data center efficiency is to integrate a cloud model. Many organizations are expanding their data center to the cloud for many different reasons. Competition in the data center space has created new offerings, better pricing, and a lot more available resources. This means that creating intelligent links between private and public cloud environments has become much easier. Data center control can now span many different cloud models where administrators don’t actually have to worry about physical infrastructure. Rather, they concern themselves with the workloads running directly on top. This type of infrastructure optimization can see a part of an environment remain in-house – while other piece is directly extended into the cloud. The beauty here is that by using cloud automation, software-defined technologies, and improved distributed infrastructure management – the cloud can be a powerful tool to optimize your data center. Optimize power usage. There’s a good reason that data centers are being built in some interesting climates. Now that bandwidth is much better and data centers can reach further – organizations are warming to the idea of deploying data centers in some pretty remote locations. For example, Iceland’s power griddraws entirely upon hydro-electric and geothermal power, ensuring a totally “green” power supply. Plus, power in Iceland is available at 4.5 cents per kilowatt hour, with lower pricing available for bulk purchases. That’s an attractive pitch when you consider the potential for fluctuations in power pricing in countries like the U.S., Britain and Germany. Outside of building a new data center, there are other direct ways to optimize power utilizing. Examine your existing environment and inspect lost power areas. For example, what wattage are your servers taking when sitting idle? Do you have good power management systems which can dynamically provision/de-provision resources as needed? Directly in line with power usage are optimizations around the overall infrastructure as well. A well monitored and maintained data center with good power regulation will see direct PUE optimizations. Improve cooling and other data center environmental variables. Data center environmentals are never easy to control. Cold or hot spots can create energy drains and poor airflow circulation. In creating data center environmental optimizations, there are several key factors to examine. This includes rack placement, server density, flooring (slab vs raised), aisle control, and much more. Furthermore, using predicative trend analysis systems helps with both current and potential future demands. Optimizing a data center also means reducing operational costs. The less money you need to spend running the environment the more you can have to spend on critical infrastructure improvements. Create management transparency. The vast amount of data center distribution and the increased utilization of cloud computing has created a new challenge for the modern data center. As one of the most important pieces around data center optimization, clear management is absolutely critical. We now have concepts around data center virtualization and even the new data center operating system (DCOS). These management platforms take DCIM, automation, cloud control, and many other data center services to a whole new level. Basically, these new management systems place all critical components under one management environment. Now, we have much more data distribution and vast data centers sharing resources over the wire. One of the best ways to optimize your data center is by knowing exactly what is being run on physical systems. From there, you’re able to make proactive decisions around resource allocation and where there needs to be improvements. The future data center will only continue to support more users. All of this will continue to drive the need for optimization-ready data center management platforms. As cloud computing and other such technologies become more prevalent, core data center technologies will need to evolve to support all of these new demands. Just like anything in technology, the data center infrastructure will evolve. Along with that will come new ways to keep your environment up and running optimally. According to a recent Gartner article the lines are becoming increasingly blurred for network managers, as BYOD is embraced by staff, customers and suppliers. Customers and suppliers are looking to connect to business applications on the network, while staff are using BYOD to access business applications and access recreational apps. How many BYOD devices are running on the network? What applications are being accessed on BYOD devices? What's the impact on the applications and on network performance? How are recreational apps affecting human productivity? How can the activity of users on these devices be managed and controlled? Gartner highlights the fact that this trend is not going away and it is likely to increase. That will mean network managers will have to adapt and develop tools that make BYOD management simple. Securing and identifying devices is the first step. Network visibility of these devices, and the ability to control applications (traffic shaping) on these devices will be fundamental to ensuring business application performance in the increasingly congested world of BYOD. Bring your own device (BYOD) is not just a purchasing policy and needs to be approached more broadly with the applications and strategies designed for today's world, according to Gartner, Inc. While most enterprises today are increasingly feeling the imperative to "do mobile," many don't know where to begin and there are many obstacles to success. Gartner says the key decision about BYOD is one of applications architecture and solutions design. "Designing your applications to meet the demands of BYOD is not the same as setting usage policies or having strategic sourcing plans that mandate a particular platform," said Darryl Carlton, research director at Gartner. "BYOD should be a design principle that provides you with a vendor neutral applications portfolio and a flexible future-proof architecture. If the applications exhibit technical constraints that limit choice and limit deployment, then the purchasing policy is irrelevant." "The community of users has expanded to include suppliers, customers, employees and a very broad range of stakeholders," said Mr. Carlton. "We are no longer developing applications for deployment to an exclusive user base over which we exert standards and control." This development is leading to the need for IT to look into the techniques and practices of what Gartner calls "global class" computing — an approach to designing systems and architectures that extends computing processes outside the enterprise and into the cultures of the consumer, mobile worker and business partners. The global-class approach exploits the characteristics of Internet-enabled computing, and employs applications and services that are more flexible and inclusive, simpler and less-expensive than those designed for enterprise. The only way to address the impact of global class is to mandate it as a principle in the applications strategy. "BYOD is an indication that internal IT is not providing adequate support for a segment of the user population and they are seeking alternatives elsewhere," said Mr. Carlton. "It's important to recognize that BYOD, bring your own application (BYOA) and cloud adoption are leading indicators of long-term structural change occurring in the industry, not the demands of a few errant staff demanding their favorite brand of technology." "For CIOs to consider BYOD activities within their organization to be a temporary problem generated by a few disaffected employees would be a tragic mistake," said Mr. Carlton. "This is a leading indicator of change for which an appropriate response is required. Reasserting control is not an appropriate response. This is a permanent and irreversible shift in the way that IT is procured and implemented to support the organization, suppliers and customers." Gartner recommends that enterprises develop their strategy based on an assumption that BYOD will happen, and that they will need to support users outside of the organization's boundaries. Starting with this assumption will mean that open standards are quickly enforced for all solutions. Convenience stores are the fast way for folks on the road to run in, grab what they need and be off to the next stop in their busy days. But when a regional convenience store chain known for its speedy service found itself spending as much as 6 hours to recover from fairly frequent failures of DVR servers used to help secure its stores it simply created too much busy work. For a couple of years, the chain's IT staff had responded to DVR server failures by pulling a technician away from whatever work was assigned for the day and having he or she drive to a store to reimage the machine. Each trip meant a half day or more wasted out of the office to perform less than 10 minutes of actual onsite work to reimage the machine and reboot. Adding insult to injury, the fully burdened cost per incident topped $2500. Meanwhile, an important security asset was offline for hours at a time. That's when the chain's IT director called the Ipswitch network management division and asked if we could make his IT life a little more, well, convenient. He told us that one of the other solutions he looked at before calling would cost $75 per device. We countered with a less costly alternative, which included WhatsUp Gold. We told him that our network monitoring solution could accomplish the same result for a fraction of the cost. They installed our product, and now when one of the DVRs goes down, WhatsUp Gold "sees" the problem immediately and instantly kicks off a script to tell the appliance to automatically re-image the DVR. The result? Productivity is up now that no one needs to drop everything and jump in a car for hours at a time. Savings are up too: it costs nearly $2500 less per incident to rectify. The IT team set up WhatsUp Gold and discovered the equipment in each store. They then created device groups for each location. This way whenever there was an equipment failure, the IT department knew immediately which store was having the problem. They then set up performance monitors on the DVR systems to start capturing data so they could find the anomalies causing the failures. They then created an Active Script Action that would preform the task of reimaging and rebooting the DVR systems. Once the script was written, it would be triggered whenever there was a failure. All of this took only a week to get done. How convenient.